CMCSA (Comcast Corp Class A) offers an objective long entry for a quick, oversold bounce trade back up to at least the 34.43 level & quite possibly to the 37.25ish area if it can take out this 60-minute downtrend line with conviction. The stock has fallen to support while at deeply oversold levels on the daily RSI not seen since November 2016, with the stocck rallying 40% over the next seven months after that previous extreme oversold reading. 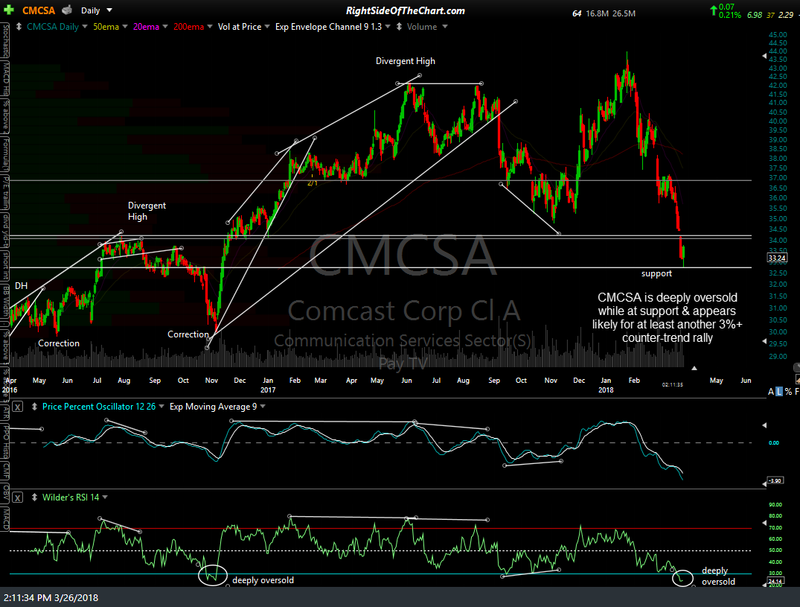 To be clear, I am not expecting another 40% rally following this current oversold reading & tag of support. The sole price target at this time is 34.43, set just below the top of the March 21/22 gap & 60-minute downtrend line. If hit, that would account for a gain of about 3.75% which is much smaller than the average gain on the official trade ideas on RSOTC. However, with market volatility elevated in recent weeks, the chances that this trade will either hit that target or the stop very soon (estimated 2-10 trading sessions). 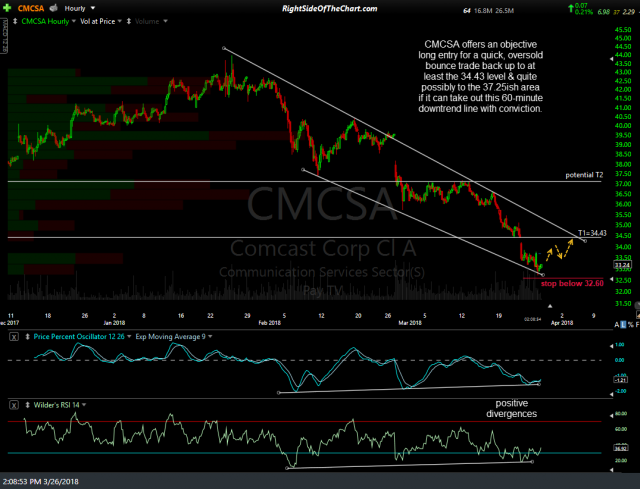 This trade also has the potential to move up to the 37.25ish level in the coming weeks if the charts of both CMSCA, the telecom sector (XTL) and/or the broad market start to firm up. If so, I might extend T2 as the final official price target & those bullish on CMCSA or the broad market might just opt to let the position run if/when T1 is hit while raising or trailing stops to protect profits. The suggested stop is any move below 32.60 with a beta-adjusted position size of 1.1.